in my opinion, it would not be fair to compare Kouign Amann with any other cake or baked good. but still, i think it deserves to be crowned king, or at least, a champion in the world of pastry and baking. 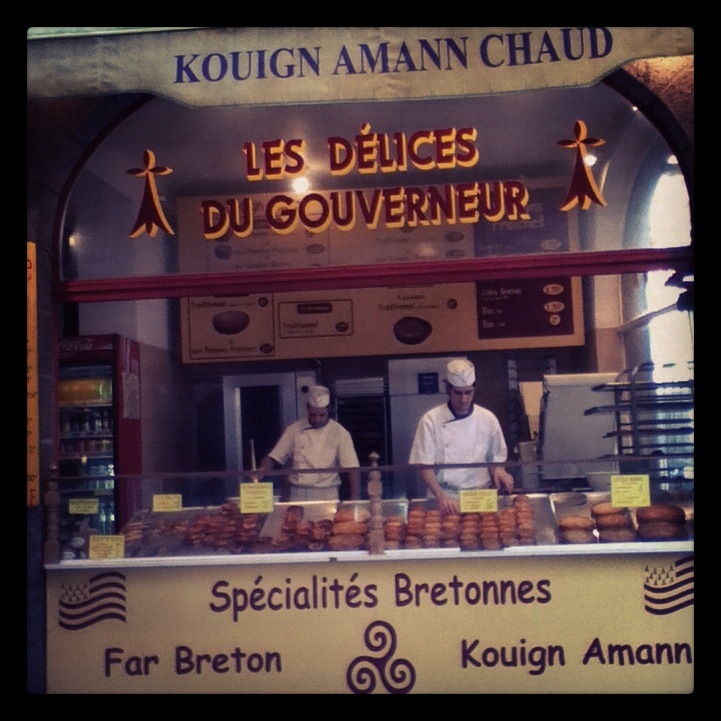 ah, to finally find a good Kouign Amann (pronounced sort of like ‘ke-WEEN AH-mahn’)! in the breton language, the name of this delectable creation translates to “butter cake”. naturally, the star ingredient in this cake is most definitely butter. Brittany, a region with such a different history, culture, and language than the rest of France, is home also to some of the country’s best butter (more on that in a future post!). this butter is put to good use here, added with sugar between layers of puff pastry. after baking in the oven, it’s got a crunchy caramelized sugar exterior, that gives way to soft layers of puff pastry, where the taste of good quality butter can really shine. my first exposure to this cake came a few years ago in Paris, one early January a co-worker brought me back a kouign amann when she visited her hometown in Brittany over Christmas. the cake had lost most of the outside crunch by the time it made its way into my hands, but the taste! that amazing flavour has never left me, i almost didn’t care if the outside was supposed to be crunchy. i returned home from Paris (indulge me in a bit of gastronomic melodrama here) a changed person, dreaming fondly of kouign amann when the craving for buttery desserts would strike. the quest to find one in Toronto proved unsuccessful (some restaurants i’ve learned have offered it as a dessert, but not often and none that i’ve seen recently). the discovery of a bakery in Montreal by the name of Kouign Amann made me so excited, i pre-ordered a whole cake in advance of the journey there. sadly, the result was such a disappointment i resigned myself to stop the search. my other option – trying to make it from scratch – was never appealing enough for me to dedicate time to, it’s no quick and easy task! one of the highlights of the Loire Valley is certainly the opportunity to see some magnificent castles. Château de Chambord is the largest one, and impressive in presence. i know it’s been quite awhile since a proper post here. some of the absence was due to a delightful road trip in France, filled with not only the company of a good friend, but our enjoyment of countless delicious French goodies. over the course of a few posts, i will share some of the highlights of our gastronomic adventure, beginning here with our meal of fouées after a long drive south from Paris to the Loire valley.